Home › Product Review › Product Review: “Men’s Starter Compression Shorts” from Walmart. Product Review: “Men’s Starter Compression Shorts” from Walmart. So, this review is going to be a no brainer for long-time runners. I suggest skipping right over it. However, for newer runners it might be helpful! I have read about “compression shorts” – and thought to myself that I needed a pair for my longer runs. I don’t have skinny thighs and in my longer runs – I would end up with some chaffing. Nothing to major, but it was uncomfortable. This concerned me a bit – especially as I am training for a run that was about 3-4 times as long as my longest runs at the time. If 6-7 miles left me slightly chafed, what was 26 miles 385 yards going to do to me??? My buddy Dustin (he is training to run the Marine Corps Marathon with me) has used compression shorts all along on his long runs. (I guess in addition to being stronger than I am – he may be smarter too!) Well I finally broke down and bought a pair. I’m cheap – so I got them from Wal-Mart for $10. I think compressions shorts may be one of the greatest things ever created for runners. Seriously. These things rank right up there with Vibram Five Fingers in my opinion. But, I do want to stress one thing. NO ONE should EVER wear compression shorts without other shorts over them unless they are on a bike. I mean literally ON a bike. If you are going to get off a bike and walk around in them – PUT SHORTS ON OVER THEM!!! (No one wants to see your junk.) There are very few people who can wander around in these things and not make other people feel slightly ill. One of the easy ways to know if this applies to you – is do you question if it might apply to you? If so, don’t do it. I mention this so that you realize I run with compression shorts – but with other shorts on over them. This allows me the benefit without making everyone else pay for it. To any new runners out there that don’t own a pair? GO GET THEM FOR YOUR LONG RUNS!!!! You will thank me for it after your next 10 miler. 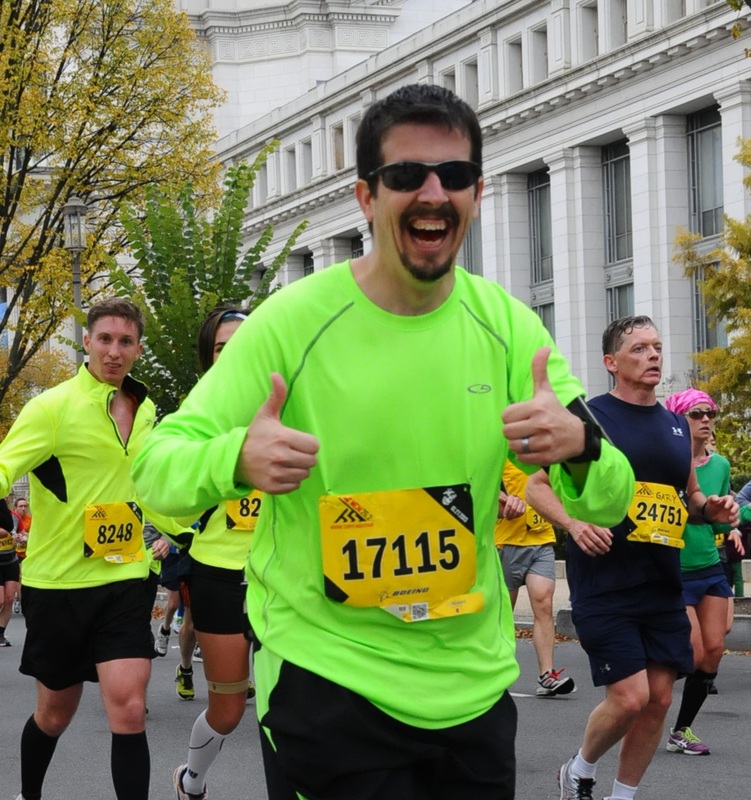 ‹ Chris Thater Race Report… JUST KIDDING!!! I will share your tip with my husband who wants to get back into running. He is a beginner runner for sure…can’t beat Walmart prices! I was just in target yesterday, and they had some great prices as well! Good to know! I actually loaded up on running skirts at Wal Mart a few months ago. Can’t beat them at $8! See you at MCM! See you at the MCM! I would not recommend anyone to buy these shorts. I bought 2 pair at walmart in Anderson, IN. The seam started pulling apart after about 2 1/2 weeks so I took that pair back and got another pair. About a week later the other pair did the same thing and the pair I replaced starting doing it about 3 to 4 weeks later. I call this poor quality clothing. If they cant stay together from where they sew them together then they are junk. I buy Nike now and they don’t fall apart. Starter shorts the only thing they are good for is the trash. Thats funny, because mine are still going strong. It seems they were made better several years ago. Thank you for letting us know your experience! Yes I had the same problem with these shorts. I guess you get what you pay for. I took mine back to Wal mart. I went and found some of the Nike shorts that you said was good. Thanks for telling about the better shorts. Maybe Wal mart should drop starter shorts and start carrying Nike shorts. Better quality. Its interesting, it sounds like their quality has gone down hill in the last several years! Thank you for sharing your experience! After a bad experience with chafing at my first 100K attempt I hit on the idea of wearing my triathlon shorts to my next ultra. The results was one of my most enjoyable 50K ever, including a quarter-mile wade down a river (yes, in the river). They dried out fast, and no chafing. So there’s another option, albeit more expensive.